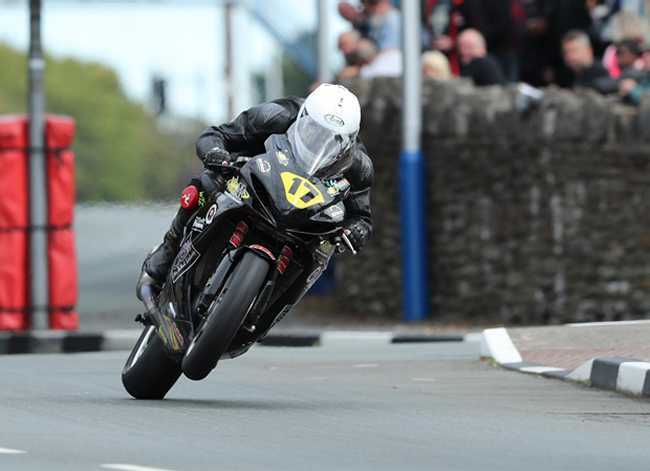 The Isle of Man’s Michael Evans, riding for Martin Bullock Motorsport, became only the third Manx rider in the event’s history to do the MGP Senior and Junior double in today’s Senior Manx Grand Prix, following up his Junior win from earlier in the week. The Senior / Junior MGP double was last achieved in 2011 by Northern Ireland rider Andrew Brady. Evans set a new lap record of 122.657mph on his opening lap, improved it to 122.866 on his second lap and was never headed over the four laps to complete the victory in a new race record of 1:15.06.669/ 120.557. After a frustrating two-hour delay due to mist and low cloud on the Mountain, the Manx Grand Prix Senior MGP Race, the final race of the 2017 Manx Grand Prix meeting, finally got underway at 12.15pm. The starting positions on the grid were based entirely on qualifying times and the first three riders were all from the Isle of Man so there was much local interest in the blue riband race. Michael Evans was first away on his Martin Bullock Motorsport Suzuki following the 122.188 he set in last Saturday’s final qualifying session. Evans was looking to add the Senior title to his MGP Junior win from Wednesday. Dean Osborne set off ten seconds later on the same Kawasaki 600 that he raced in the Junior race with Jamie Williams third away from the Glencrutchery Road start line. With Royce Rowe recovering from his injuries from the Junior race, Barry Lee Evans was fourth off the line on a Suzuki GSXR 750. Michael Evans was fastest on the clock, and first on the road, to Glen Helen, establishing a lead of over 5 seconds from second placed Barry Lee Evans with Wayne Humble making a mockery of the qualifying times by moving into the top three from a grid position of 24 although he had dropped to twelve by Ramsey, possibly encountering traffic from his low starting position. Evans’ lap record on the opening lap gave him a six second lead from Barry Lee Evans (121.980). There was a local battle emerging behind the Welsh rider with Manx rider Jamie Williams (119.939) completing the top three and fellow Islanders Osborne (119.348) and Joe Faragher (119.091) completing the top five. Faragher was reported to be a retirement at the Gooseneck, which saw Tom Robinson move into the top five at the Bungalow. However Evans at the front of the pack was experiencing no such misfortunate and his second lap record of the race, slowing down into the pits, moved his lead up to over ten seconds from Barry Lee Evans. By Glen Helen on the third lap, the battle of the Evans’s saw Michael’s lead grow to thirteen seconds over Barry Lee. Behind the leading pair, Osborne moved into the final podium place with a quicker pit stop than Williams and was six seconds ahead of Williams at Glen Helen in the battle of the local riders for the final podium place. Darren Cooper’s second lap of 118.692 nudged him ahead of Tom Robinson into the top five but he immediately lost time with a thirty second pit lane speeding penalty which saw David Lumsden move into the top five. Michael Evans consolidated his lead with a third lap of 116.413,which included the pit stop. However there was drama for the PRF team with Barry Lee Evans pulling into the pits at the end of the third lap with a loose chain. With Barry Lee Evans’ unscheduled stop, Michael Evans’ lead grew to over a minute at Glen Helen but Dean Osborne, taking advantage of Barry Lee Evans’s problems, was chasing the runner-up place only a second behind the Welsh rider at Glen Helen on the final lap. Michael Evans took the chequered flag with a fourth lap of 120.520 to win the race by over a minute in a new record time (1:15.06.669/ 120.557mph). Barry Lee Evans (1:16.07.013/ 118.964) held off the challenge of Dean Osborne (1:16.18.323/ 118.671) to take the runner up slot by 11 seconds. Osborne was the first 600cc machine home behind the two 750’s. David Lumsden (1:16:43.347/ 118.025) edged ahead of Jamie Williams (1:16.46.136/ 117.954) to take fourth with the Manx rider completing the top five. Ballymoney’s Darryl Tweed, runner up in Monday’s Newcomer A race performed impressively to finish as the first newcomer in 8th place with 1:17.35.279/ 116.709. Three more riders joined the 120mph ‘Tommy’ Club during the race – Barry Lee Evans, Dean Osborne and David Lumsden.